A slender darter with a series of 10-15 small, indistinct, dark blotches or bars along the midside. Head very long and slender. One or more enlarged and modified scales lie between the pelvic fin bases; the breast is naked except for a few enlarged and modified scales. Back and upper sides yellowish-brown, mottled and spotted with darker brown; lower sides and belly creamy white. Midside with a series of small, dusky blotches, ending at base of tail fin in a small black spot. Spinous dorsal dusky with an outer orange band; soft dorsal and tail fin faintly banded with brownish lines. Breeding males have considerable black pigment on body and fins. Similar to the slenderhead darter, but with a longer snout (the eye closer to the rear edge of the preopercle than to the tip of the snout); and with 7 (not the usual 6) branchiostegal rays (slender, curving bones in the membrane at the lower margin of the gill cover). Adult length: about 2-4 inches. During most of the year, it lives in pools and backwaters having little current and firm substrate, sometimes with thick growths of aquatic vegetation. In spring it moves to raceways and riffles having moderate or strong current and depths of 1-3 feet. Individuals—probably strays—are sometimes found in reservoirs. In large part, it is those reservoirs that have reduced their habitat in our state. Like most other darters, this species forages on aquatic insects. Known only from historical collections on the White River (Stone, Taney counties) and, more recently, from the St. Francis River and Lake Wappapello (Madison, Wayne counties). Other populations occur in Arkansas and Oklahoma. 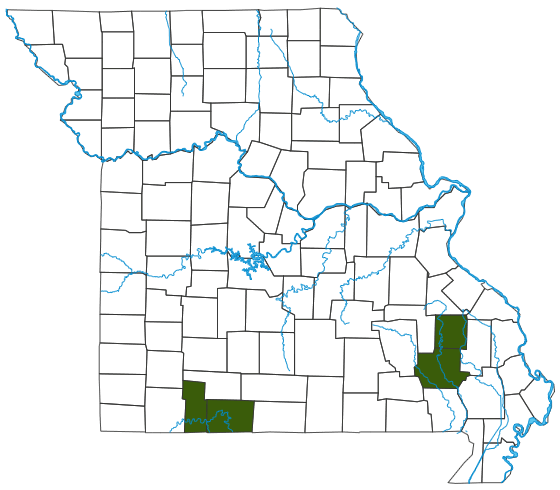 State Endangered; a Species of Conservation Concern in Missouri. It has an extremely limited distribution in medium to large Ozark rivers, and it is extremely rare. The White River location where they had historically been collected is now covered by Table Rock Lake, so those fish are likely gone. Thus the St. Francis River and Wappapello populations are probably all that remain within our borders. For them to survive, their streams must be protected against sedimentation and pollution. In spring, longnose darters leave their quiet backwaters and move to places with stronger current to breed. Not much is known of their spawning behavior, but apparently egg-laying occurs in pools within those raceways. Missourians can be proud of our state for many reasons. One bragging point we have over most of the neighboring states is the richness of our fish community, including rare types like this darter. There are more than 200 kinds of fish in our state. Kansas, for example, only has about 140. Darters are adapted for life in the swift-flowing sections of clear, rocky streams. Their swim bladders are reduced or absent, so they don’t float away, and their enlarged pectoral fins help them cling to rocks. With their unique place in the stream, they have a special ecological role, too.